If you are fresher and going to attend an interview, then go through this article in order to know the mistakes that you have to avoid. Here, we have provided some top 10 mistakes that you should avoid while attending an interview. If you stop making the things given below, then you will definitely crack the job in the first attempt only. 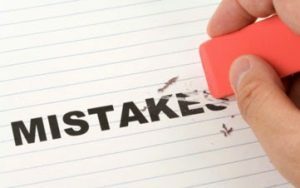 Therefore, check the common top 10 mistakes by freshers that they must avoid while searching for jobs. Here are some top 10 mistakes by Freshers while searching for a job. Making an ineffective resume is the most common mistake committed by every fresher. Your resume represents yourself clearly. Most of the candidates just edit their friends’ resumes and carry it for the interview. This is a very big blunder done by the freshers. Since many interviewers ask some questions from the resume and if you fail to answer those questions, then you will be a big flop in that interview. Hence, it is better for you to prepare your resume on your own by enclosing all your skills and career goal. Also, you have no need to make a lengthy resume. Short and effective resume will fetch you a good job. Therefore, prepare a good resume and crack your dream job. The most common problem faced by every fresher is the lack of communication skills. The main quality that every recruiter see in the candidate, for hiring them is good communication skills. The candidates face problems in expressing their ideas, issues, and much more within the team if they are having poor communication skills. Only with the good communication skills, you can easily collaborate in the work environment which promotes employee productivity and innovation. Hence, it is good for you to improve your communication skills in order to crack job and enhance your career in the company. When you are making a project, you need to know complete details of that project. But most of the candidates fail to explain even their project objective during the interview because of fake projects or lack of involvement in the project. So, you must gain complete knowledge about your project before attending the interview. The recruiters don’t expect much technical skills from the freshers. They ask just basic questions from the technical subjects. But some of the candidates also fails to answer those questions. Hence, you must prepare some of the basics of all your subjects in order to achieve the job. It is not possible for every candidate to get a job in their first attempt. So, the candidates must not get depressed and should not stop job searching. From the interviewer’s feedback, you have to overcome all your drawbacks and attend the interviews. These days, all the freshers are learning courses like SAP, Testing Tools, Cloud Computing, etc, which is a waste of time and money. As a fresher, you have no need to learn any course. Your basic technical skills are sufficient to get a job. The company trains you in the required domain. Instead of running over various courses, Go for one apt course in which you are interested. The common question that most of the interviewers ask is ‘Say something about their company’. But the candidates fails to tell few points about the company. So, it is important for you to do a background check about the company your attending for the interview. These days, the freshers are having a high percentage but they are lacking in practical skills. As you are a fresher, the recruiters check that you are having good practical skills are not. So, to crack a job improve your practical skills. You should not have any confusion in your career goal. If you interested towards corporate sector jobs, then prepare for that. Otherwise, if you want to crack a Government Job then only prepare for that. Don’t concentrate on both types of jobs. Have a clear goal about your career. First Impression is the best impression. You will be rejected due to your appearance also. So, you need to wear ironed and formal light colour dresses while attending an interview. Therefore, these are the some important thing that you have to keep in mind while going to attend an Interview.